Maynooth Castle (N935376) was built in the first half of the 13th century by Gerald FitzGerald, Baron of Offaly. It was enlarged and added to many times in the succeeding centuries. In the 16th century it was owned by Silken Thomas and was captured by the Lord Deputy, William Skeffington. In 1552 the castle was restored to Gerald, 11th Earl of Kildare. The Earl of Cork restored the buildings in 1630 and the Confederate Catholics occupied it in 1641. It was abandoned by the FitzGeralds about 1656. The castle is entered through a magnificent square gatehouse to the south. To the east of this is a square tower forming part of the boundary wall and to the north and west is a huge rectangular keep. There are fragments of the curtain wall in the east. The keep is entered by a modern stairway at first floor level. This leads to a large vaulted room beyond which is a similar room. Directly opposite the doorway a spiral stairway rises to above the vault. Here there were possibly two large rooms but the dividing wall is fragmentary. There is at least one more storey above this. This upper storey is lit by large two-light windows. They are set within deep recesses and there are good window seats. There may be several mural chambers. The keep originally had four corner turrets of which fragments remain. There are no visible fireplaces. The tower at the south-east corner of the castle has three storeys plus attic. A spiral stairway at the north-west rises to first floor level. A murder-hole protects the doorway in the north wall. There are mural chambers at the two floors above this. There is another doorway in the south wall. An exit Iow down in the east wall may be for a latrine chute leading from one of the mural chambers. The monument was closed on this occasion but many of the features are visible from outside the railings. Castletown Conolly, Celbridge (N978342) is a large house three storeys high over a basement. It has a 13 bay front flanked by curving Ionic colonnades and two-storey 7 bay wings. It was begun in 1722 and partly designed by Sir Edward Lovett Pearce. One of the wings houses the kitchens and the other has the stables. There are very many fireplaces throughout the building but all the flues have been channelled through just two chimney stacks. This was done to avoid taxes. The large dining-room has a devil-cracked mirror and hearthstone. There is a cantilevered stone stairway with a balustrade of brass columns and a unique print room. After the house ceased to be a family home it was stripped of most of its furniture and paintings to raise money for.' repairs. Many of these items have since been recovered. In the basement is a fine vaulted corridor and one of the small basement rooms is fitted out as a Victorian kitchen. The splendid long gallery on the first floor still has a pair of magnificent coloured glass chandeliers. From the rear window can be seen, at about 3km distance, Conolly's Folly, an obelisk raised on arches. It was built by Speaker ConolIy's widow about 1740. A similar distance to the east is the Wonderful Barn, a five-storey conical structure, which was erected in 1743 to relieve famine distress. It has vaults at several levels and an external spiral stairway at the upper levels. It is not open to the general public. 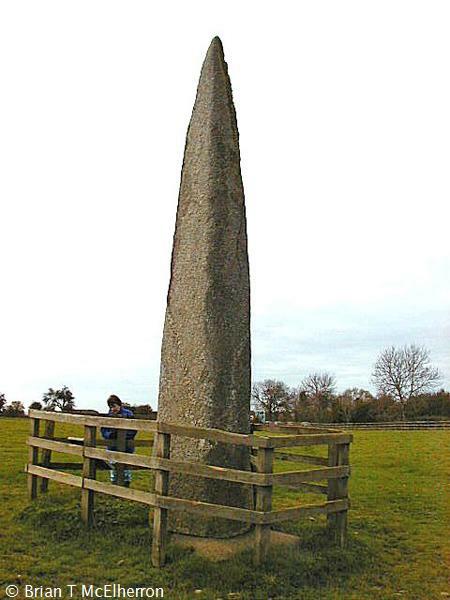 The standing stone near Punchestown Racecourse (N917164) was viewed. It is about 7m high and tapering. When it fell in 1931 an empty stone cist was found near the base. The stone has now been re-erected in its stone-lined socket. About 1 km away, in Craddockstown West is another stone over 4m high and about 4km away, in Forenaghts Great is a third stone, about 5m high. A stone cist was found near the base of this stone also. These are some of the largest surviving standing stones in Ireland. A destroyed example in Co Mayo was twice as long. However they are small when compared to the standing stones of Brittany one of which is 12m high. Another, now broken, was nearly 20m long. Kilteel Castle (N984212) is a very fine gatehouse - a strong tower with attached gateway. It is about five storeys high. The door is locked but leads to a vaulted chamber. A stairway, housed within a projecting round tower, rises on the left. On the other side of the village is a fragment of a High Cross and other carved stones. A short distance from this (N996222) is a ruined nave-and-chancel church with fragments of a richly decorated chancel arch of three orders. 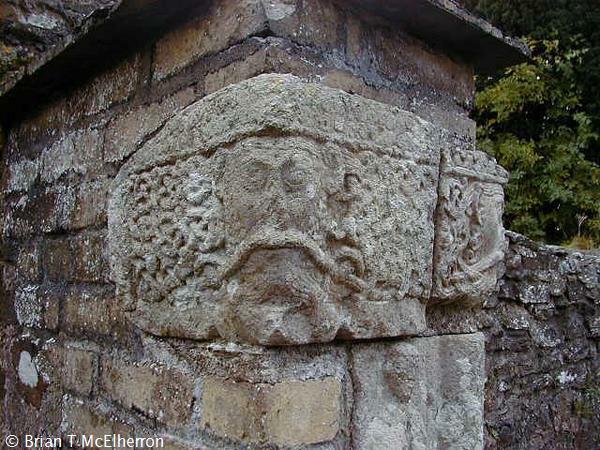 The capitals are fairly typical examples of Romanesque art with heads having intricately entwined beards and hair. The columns have figure sculpture and represent the only instance of such sculpture in the part of an Irish Romanesque church. The subjects include Adam & Eve, Samson & Delilah and David & Goliath. There is also an early cross slab and a stone with a small bullaun. To the north are three fragments of the town wall with another gateway. At Eadestown (N951179) there is an interesting fountain. It was erected in 1899 to the memory of Captain Tickell by his tenants. The fountain was designed for drinking at three levels. The lion-head spouts were presumably for humans, the circular trough for horses and the quarter-circle dishes at ground level were for hounds. The bracket attached to the top of the fountain may have been for hanging the cup. Fountains are probably the biggest class of memorials apart from gravestones and Captain Tickell's fountain is one of the best examples. In 1669 Charles II created the Manor of Blessington for Michael Boy/e, Archbishop of Dublin. In 1778 it passed to the Hill Family under Lord Hillsborough who became 1st Marquis of Downshire. The Hills owned extensive lands in Wicklow, Kildare and Kilkenny as well as in Down. In the centre of the town the Lion Fountain was erected in 1865 to commemorate the coming-of-age of the Earl of Hillsborough. Behind it is the market house which dates from the early 19th century. It is now the Credit Union House. On the opposite side of the road is the parish church which was originally built in I 682 by the archbishop. Parts of the original building survive. A short distance to the south is a large horseshoe-shaped archway which presumably led to the local smithy. Russborough House (N95710) was begun in 1741. It was designed by Richard Castles and Francis Bindon for Joseph Leeson, a wealthy Dublin brewer. Leeson later became 1st Earl of Milltown. It consists of a seven-bay central block of two storeys over a basement. It is joined by curving Doric colonnades to two-storey seven-bay wings attached to outbuildings by walls with rusticated arches surmounted by cupolas. The entrance front is over 200m long. The house overlooks the Poulaphouca Reservoir and there are interesting gateposts leading to the parkland in front of the house. These feature obelisks supported by four stone spheres. The house is open to the public and contains a magnificent art collection as well as some fine furniture. The decor includes some excellent plasterwork possibly by the Francini Brothers. The monastery at Glendalough was founded by St Kevin in the 6th century. It was one of the most famous religious centres in Ireland and its turbulent history and notable monks and abbots are mentioned many times in the annals. One of its most famous abbots was St Laurence O Toole who became Archbishop of Dublin in 1163 and was the first canonised Irish saint. 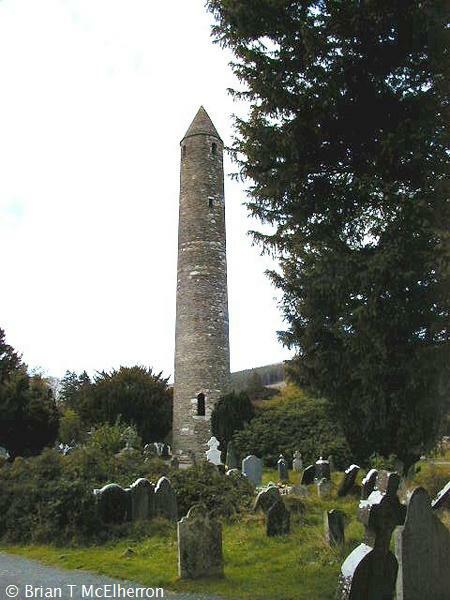 Glendalough contains the remains of at least seven churches, a Round Tower, a High Cross and many other structures. The monuments are spread over about 3km. Some of them are clustered round the bottom of the Upper Lake with another cluster a short distance below the Lower Lake. There are several isolated monuments. The best place to start from is the Visitor's Centre. A short distance to the east, on the same side of the river, is Trinity church. This small nave-and-chancel church probably dates from the 12th century. It has a round-headed south doorway and a flat-headed west doorway. The small rectangular area attached to the west was once topped by a round tower which was blown down in 1818. There is a simple chancel arch and both round-headed and pointed windows. The exterior corners have corbel stones which once supported wooden rafters. On the other side of the river, about 1km downstream, is St Saviour's Priory (T133963). This is a nave-and-chancel church with some attached buildings. The east window of the church and the chancel arch have fine Romanesque decoration including animal and human masks and geometric patterns. The nave of the church was reconstructed in the later medieval period when a new building was added to the north. There was a great deal of reconstruction of the church in 1875. A short distance to the west of the Visitor's Centre the main body of the site may be entered through the remains of the Gateway. This is the only surviving example in Ireland. It is a square building with round arches in the north and south walls and was originally two storey. The most visible monument from the Gateway is the Round Tower. This is about 31m high. The doorway is about 1.7m high and about 3m above ground level. The conical cap was rebuilt in 1876 using original stones. A short distance to the south of the Round Tower is a small building called the Priest's House. It has the remains of a Romanesque arch on the exterior of the east wall and a carved panel over the south doorway. This is now incomplete and very worn. It apparently depicted a robed central figure with a kneeling figure on either side. To the east of the Priest's House is a large nave-and-chancel church known as the Cathedral. This has a flat-headed west doorway with inclined jambs and a fragmentary Romanesque chancel arch. There are some interesting gravestones attached to the inner wall of the church and a very fine bullaun stone built into the base of the north wall of the chancel. A short distance to the south of the Cathedral is a tall plain high Cross with an unpierced ring. A short distance south east of the Priest's House is St Kevin's Church or St Kevin's Kitchen. This is the only surviving roofed building at Glendalough. It was originally a small rectangular single-celled church with a croft in the roof and a belfry (round tower) at the west end. There is a lintelled west doorway with inclined jambs. A chancel and sacristy were added in the east but the chancel has now been removed. Beside the church is a very fine bullaun stone. A short distance away is the Iow ruin of a small nave-and-chancel church known as St Kieran's Church. In the field to the west of this cluster of monuments is another nave-and-chancel church known as St Mary's Church. This has a very fine saltire cross inscribed on the underside of the lintel. On the other side of the river, near the path to the Upper Lake, is a large bullaun stone known as the Deer Stone. The most notable structure near the Upper Lake is Reefert Church. This nave~and-chancel church possibly dates from the 11th century. It has a flat-headed west doorway with inclined jambs and a number of round-headed windows. There are corbel stones at all the exterior corners to carry the wooden rafters. Beside the church is a rough stone cross with a faint carved pattern at the centre. There are a number of other small stone crosses throughout the site and some stone-lined graves in the graveyard. A short distance away is a circular structure which may be the low remains of a small cashel. There are traces of a low platform running round the inside of the wall. There are several other monuments close to the Upper Lake but they are not easily accessible. In the graveyard near Newabbey House (N847093), to the east of Kilcullen, is a very fine 15th century double effigy of Rowland Eustace and his wife. Built into the wall of the ruined abbey are some weeper panels and other carved stones which are probably part of the same tomb. The weepers include St Catherine and St Michael. In the graveyard at Old Kilcullen (N829070) is the stump of a Round Tower. It is about 10m high and has a round-headed doorway. The doorway is less than 2m above ground level and about 1.7m high. Beside it is part of the shaft of a decorated High Cross. One the east face are the Twelve Apostles in three groups. On the north face one of the panels shows MacTail, Son of Adze, founder of Kilcullen, with crozier, bell and book, smiting the enemy. The south face shows panels of ornament. One of the panels on the west face possibly shows the Flight into Egypt. The cross may date from the 9th century. Nearby is the plain shaft of another cross and the base of a third. There is also the low ruin of a nave-and-chancel church. The High Cross at Moone (S790937) stands on the site of an Early Christian monastery allegedly founded by St Columba. 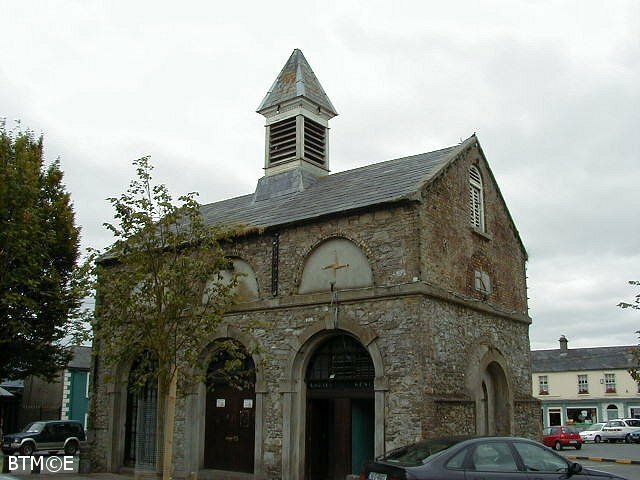 It was raided in the middle of the 11th century and in the 13th century the FitzGeralds founded a new church on the site. The cross was discovered in the 19th century in pieces and re-erected. The middle section of the shaft was missing for many years but was found buried towards the end of the century and the cross was completed. Unfortunately iron bars, which were used to hold the pieces together, rusted over the years and caused some damage to the stone. In recent years the cross has been repaired and re-erected within the ruined church. Some modern stone inserts have replaced damaged and missing portions. The cross is over 5m high but appears to be much higher. This may be due to the relatively small head and the tall narrow base which is in the form of two truncated pyramids. Almost all of the flat surfaces are covered with figure sculpture. The subjects include Daniel in the Lions' Den, the Sacrifice of Isaac, Adam & Eve, the Multiplication of the Loaves and Fishes, the Flight into Egypt and the Three Children in the Fiery Furnace. Other panels show spirals, angels, beasts and St Anthony & St Paul. Nearby are fragments of another cross which also has some figure carving. St Dermot, or Dermot the Hermit, founded a monastery at Castledermott (S783850). It was plundered several times by the Vikings in the 9th century. Cormac Mac Cuilleannain, the famous scholar, king and Bishop of Cashel was buried here in 908 after losing his head in battle. The monastery was again plundered in the 11th century and the last known abbot died in 1973. The pathway from the gate is spanned by a reconstructed Romanesque doorway from a vanished church. The doorway of the present church is a copy of the earlier doorway. Beside the church is the stump of a Round Tower with a castellated top. It is about 20m high and functions as a belfry for the church. There is s square-headed doorway at ground level but no sign of an older doorway higher up. To the north of the church is a granite cross just over 3m high. In the centre of the west face is the Fall of Man. Other subjects on this face include St Anthony, Daniel in the Lions' Den, David the Psalmist and the Sacrifice of Isaac. On the east face is the Crucifixion and the Apostles in four groups of three. On the south face of the base is the Miracle of the Loaves and Fishes. Elsewhere on the cross there are panels of interlacing and spirals as well as other figure sculpture. Another granite cross to the south of the church is slightly taller. The decoration on the east face is mainly geometric but elsewhere there is good figure sculpture. The centre of the west face has the Crucifixion and beneath it is a small panel showing the Three Hebrew Children. Also on this face may be seen Daniel in the Lions' Den, the Fall of Man, David the Psalmist and the Sacrifice of Isaac. The south face of the base shows the Miracle of the Loaves and Fishes and above this, on the shaft, may be seen the Twelve Apostles in pairs. A short distance to the east of the cross is a small rectangular stone with a perforation and an incised cross on the east face. To the north of the cross is another round perforated stone and to the west is a hog back stone with a faintly inscribed cross. It may mark a saint's grave. There are also several trapezoidal coffin stones and the base of a third cross. Near the south end of the town stands the ruin of the Franciscan Friary (S783848). It was founded in 1302 by Thomas, Lord of Ossory and plundered by Bruce in 1317. The original church was rectangular with a doorway and a pair of lancet windows in the west wall. A tower was attached to the south side. The north transept was added later, possibly by Thomas, 2nd Earl of Kildare, in 1328. The transept has some east chapels. Within one of these is a tomb-chest with, on the lid, a double skeletal image, one within a shroud. There is also a good bullaun stone. Athy was important in history because it commanded an important ford over the River Barrow. It is named after Ae who was defeated in the 11 th century. At the end of the 13th century the Anglo-Normans built a strong castle to control the ford. In the 16th century the White Castle was built to control the bridge. In 1796 the Crom-a-boo Bridge was built beside the White Castle. 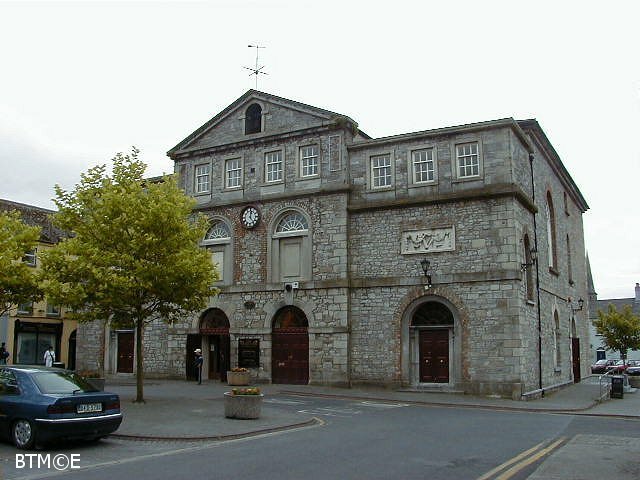 Within the town there are some fine 18th century buildings which include an excellent market house. This now contains an exhibition hall, a library and the fire station. At Monasterevin (N620106) the Grand Canal is carried over the River Barrow by a fine aqueduct. Beside this the road crosses the canal by a drawbridge and a short distance upstream the railway crosses both river and road. Further upstream the road crosses the river and downstream is a lock and bridge. Beside the drawbridge is a small basin of four bays with a canal hotel and warehouses. These have now been converted into apartments and added to. The grounds of the cathedral at Kildare were locked and we could not view the High Cross, Round Tower and church. However in the market square there is a curious market house which is now the tourist office. This is one of the smallest market houses in Ireland. The upper storey held water tanks installed by the Water Commissioners and the lower storey was an open arcade. In 1789 the County of Kildare Canal Company completed a canal from the Grand Canal near Sallins to Naas, a distance of two and a half miles. It incurred such heavy debts that the Company was forced to go into liquidation. The Grand Canal Company bought the whole concern in 1808 for �2,250. They improved the canal and extended it to Corbally, a further five and three-quarter miles. The canal harbour at Naas has been given a recent facelift. It now appears as a quiet backwater with an extensive well-lit seating area. Some of the canal warehousing shows signs of recent renovation. One minus aspect of all this is that the basin appears to hold the largest collection of sunken supermarket trolleys in Co Kildare. By 1784 the main line of the Grand Canal had reached Robertstown and a twice weekly passenger service, which had been established four years earlier to Sallins, was extended. 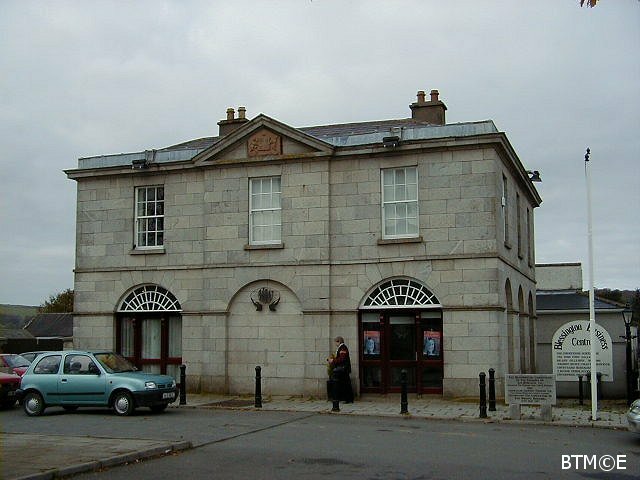 To accommodate the trade a hotel was built in Sallins and later in Robertstown. The Robertstown hotel still exists and has been recently renovated. It is a seven-bay three-storey building. The village is a typical one-street canal-side settlement. The harbour is merely a widening of the canal and is crossed by a typical hump-backed canal. In the second half of the 18th century the road system in Ireland was still poor. The quality of the roads depended a lot on the local landlords and local government. Most of the major roads consisted of a collection of turnpikes of variable quality and it was reckoned to be faster and safer to travel by sea from Dublin to Belfast than by road. The canal companies were quick to run passenger services which had no rival until Bianconi started his express coach services and the railways were established. Carbury Castle (N687350) was inspected closely. The motte on the site was probably built by Meiler FitzHenry who was granted the area by Strongbow. The castle was acquired in the 14th century be the de Berminghams. They probably built the older parts of the existing castle. In the 15th century it was taken by the native Irish and in 1562 it was granted to the Colley (or Cowley) Family. They were the ancestors of the Dukes of Wellington. The Colleys built a large strong house early in the 17th century. Originally there seems to have been a rectangular building with vaulted rooms at the lower level. A projecting wing seems to have been added on the west side although the stonework in both sections is similar. An added section on the east side has four 17th century chimney stacks and some large mullioned and transomed windows. The top of the hill may be partly artificial. A short distance south of the castle is a graveyard with the scant remains of a church, Teampall Do-Ath and an early 19th century Colley mortuary house. The banks of the Royal Canal were briefly touched at Innfield as we headed north to Meath and a rendezvous at Trim. The Yellow Steeple (N804569) at Trim is two walls of a very tall tower with a two light pointed window near the top. There are traces of vaulting above and below this. The doorway is now capped by a lintel which appears to have come from a two-light window with ogee heads. To the left of the entrance is a spiral stairway which rises to roof level but cannot now be climbed owing to a large gap near the bottom. Closer to the river is the Sheep Gate, which is part of the town's defences. Beside St Patrick's Cathedral (Col) (N802573) is a church ruin with a three-light window in the south wall. It has a square hood mould with two masks as stops. A number of carved fragments have been collected inside the ruin. At the NW corner of the cathedral is a fine rectangular tower with a small projecting turret at its NW corner. Near the top of the tower are some small windows. One of these is surmounted by a mask. Trim Castle (N803567) has a massive square keep. Wings project from three of the walls which are about 3m thick in places. Entry is now made at first floor level via a modern stairway. The projecting wings contain small rooms and spiral stairways. The main portion of the keeps is bisected by a thin wall. A tour of the interior is now possible via modern gangways and the original spiral stairways. The keep is three storeys high with small turrets at each of the corners. There is at least one fireplace leading to a round chimney. There are many remains of the outer defences. These include regularly spaced round towers in a curtain wall. There is a fine rectangular gatehouse (polygonal within), which has the channel for a portcullis and two murder-holes. On the opposite side of the ward is another gatehouse with similar features. At Newtown Trim, the Friary and Hospital of St John the Baptist (N818568) is an extensive ruin with a residential tower at one end, The tower is vaulted above the ground floor. The church has a good three-light window and there are remains of a number of vaulted rooms. There are some traces of a curtain wall with a small corner turret. On the other side of the river is the Cathedral of SS Peter & Paul (N815568). A small church, separate from the main buildings, contains the 16th century double effigy tomb of Sir Luke Dillon and his wife, the Jealous Man and Woman. The panels depict coats of arms and one short panel has kneeling weepers. Scattered on the tomb are many rusty pins and pebbles. These are part of a local cure custom. On the outside wall of the church is a tomb niche with a decorated hood featuring a head with long plaited hair. The cathedral is a large rectangular church with some good lancet windows. There is a large double piscina (or small sedilia). Opposite it is a much worn effigy set in a recess behind a grid. There is some decoration at the windows and at the doorway which is blocked. A corbel stone on the wall has a carved angel, There are some traces of mural passages. The domestic buildings nearby are extensive. There is one good decorated window and some of the small windows have pecked decoration. Bective Abbey (N860600) was inspected. This Cistercian abbey was founded in 1147 by Murchad O Maeil-Sheachlainn, King of Meath, and dedicated to the Blessed Virgin. Hugh de Lacy's body was buried here in 1195, but was later transferred to St Thomas' in Dublin. There are substantial remains of the cloister, a series of triple arches. One of the pillars has a mask on one side and a figure on the other. Little remains of the church which had a south aisle, the arcade of which is now blocked. There is a tower at the NW corner of the church. All the other remaining buildings run south from the church. These include a massive tower at the SW corner of the cloister. The tower is four storeys high with crenellations. There are fireplaces at the three upper rooms. A projection at the SW corner houses a spiral stairway which is fragmentary above the first floor. A series of two-storey buildings bounds the cloister at the south and east. They have very fine vaults at the ground floor.